When you’re driving through the streets of Cassville, you need to make sure your tires are prepared for the ride. 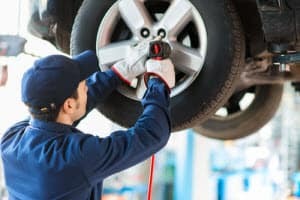 Otherwise, you may wind up asking yourself, “How long can I drive on a spare tire?” One of the best ways to ensure your tires are performing as well as they can for as long as they can, is to get regular tire rotations. 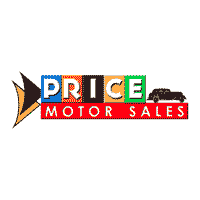 For quality service in Cassville, PA, the service center at Price Motor Sales is happy to help. In the heart of southern Pennsylvania, you’ll find the beautiful borough of Cassville. Home to roughly 141 people, this tight-knit community is a great place to live and work. The town acts as a nice getaway from the more densely populated areas, while still having quite a few attractions of its own. In Cassville, you’ll find a multitude of specialty shops and local restaurants. The arts scene is quite popular, especially when done in conjunction with lessons about local history. If you’re looking for a more outdoor experience, there are quite a few well-maintained parks in and around Cassville’s 0.6 square miles of land. To make sure your tires can handle all your Cassville adventures, you’ll need a place to get your tires rotated properly. Our service center has got you covered. 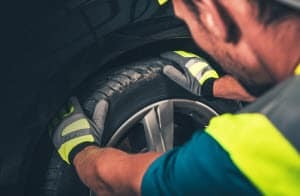 Our team of technicians is capable of performing just about every service a vehicle could ever need, so a simple tire rotation will be no problem at all. Equipped with the latest in auto repair tech, you can be sure that our professionals will provide you with the quick and quality service you deserve.In addition, our service center comes with quite a few features you may find enjoyable. You won’t have to replace your tires during this service, but when it does come time to swap them out, we have high-quality Goodyear® and Michelin® tires available. We’re also happy to offer rentals and even provide a shuttle service for you, so you don’t have to put your day on hold. Tire rotation is absolutely necessary for every vehicle due to one simple fact: All your tires won’t wear down evenly. Your front tires are the ones that have to deal with all the turning, so that tends to wear down the outsides faster than the insides. On the other hand, your rear tires mainly just follow the front tires, so they wear fairly evenly. A variety of different factors can affect the rate of wear, but that’s the general idea. Tire rotation is a great way to counter this, as it simply involves moving your tires from one position to another, whether it’s moving your front tires to the back or moving them diagonally to resolve a specific problem. Fail to get your tires rotated, and they’ll be worn down thousands of miles earlier than they could have been. For tire rotation in Cassville, PA, you can count on, the Service Center at Cassville is happy to help. Our specially trained technicians can handle all your tire problems, so don’t hesitate to stop by. Contact our friendly team or use our handy online tool to schedule your service appointment today!